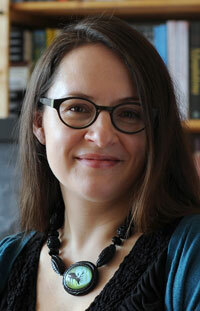 Anna Jarzab (MAPH’07) is the author of All Unquiet Things, The Opposite of Hallelujah and Tandem, the first book in the Many-Worlds Trilogy. She lives in New York City and works in children’s book publishing. 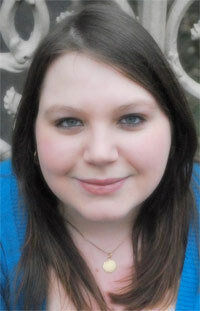 She is represented by Joanna MacKenzie at Chicago’s Browne & Miller Literary Associates. Joanna MacKenzie (MAPH’02) is an Agent at Browne & Miller Literary Associates, where she began as the Assistant to the President in 2003. The two MAPH alumni took a moment to talk about multiple worlds, writing books, and Space Camp. Joanna MacKenzie: Is it still strange or surreal to see your name on the cover of a book or your books in stores? I’m just assuming that the first time is a bit surreal. Do you ever get used to it? Anna Jarzab: It’s really cool to see my name on the covers of books. Writing books is sort of strange because you spend years and years working on something, and then it comes out, and you’re like, hm. All those years and all that work just to make this little thing. And you can hold it in your hand—it’s solid and real. I started writing books because my primary way of entertaining myself is telling myself stories, and it’s bizarre to have my daydreams become something you can buy in a store. JM: Tell me a bit about where your stories come from. AJ: I actually think about this a lot, because when you’re at the end of a project, inevitably you look backwards and think, how did I get here? And what you realize—or, at least, what I end up realizing—is that some stories come together all at once and some evolve over time, accumulating levels of detail and complexity. For instance, about three weeks ago I woke up in the middle of the night and was just laying there, and suddenly I had the idea for a book that I got up and wrote down. Ever since then it’s been blossoming in my mind as I furiously try to take notes. 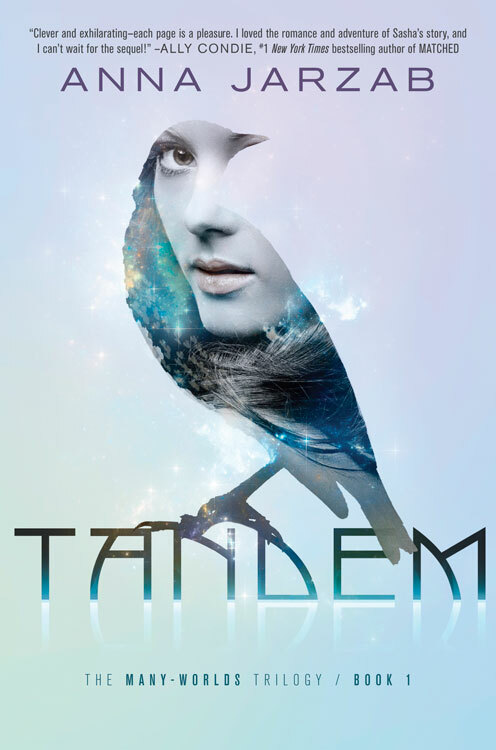 But with Tandem, my latest published novel, the idea was as simple as, “I want to write a book about parallel universes!” and then it took me a long time of trial and error to get the story to what it is today. I’m finishing up an adult novel now for which I’ve had the idea since 2002—”enchanted bar in New York”—and didn’t know how to write the book until June of 2012, when I figured out who the main character is and what her situation is. It took living in New York for many years to finally understand what the story should be about. I’m working on another YA novel that was inspired by vacations to Oklahoma and an episode of Snapped, and it came together pretty quickly compared to something so high concept as Tandem, which needed much more work to get where it is. So, really, the ideas come from everywhere, but getting to the point where the stories make sense and say something varies from book to book. JM: For those who may not already know, you also work in publishing as a Digital and Social Marketing Manager at Penguin Young Readers Group. Can you tell me a little bit about your job? AJ: I’ve worked at Penguin for a little over four years and always on the digital marketing team. My job has evolved over the years, but now I work almost exclusively on developing and executing social media campaigns for our titles and brands across a variety of platforms. I also work on quite a bit of social advertising. JM: Is it hard to work in publishing while writing your own books? How do you separate the two? AJ: Yes, it is hard. Sometimes, it’s very hard, and sometimes it’s only mildly so, depending on what’s going on in either of my careers at the time. There was a long period of time this year when both things were very, very bad and I felt like I was being buried alive by books. There are benefits to it, like that as a result of my job, many of my friends work in publishing and I can talk to them about my difficulties or triumphs and they don’t need anything explained to them. Or the simple fact that you’ll never talk more about what makes a book good than at a publishing house, which benefits my writing. But to your question, I’m terrible at separating the two. It’s too hard, especially since the company that I work for and the company that publishes my books are technically now one company. I just try to muddle through as best I can. JM: What is your favorite part of the publishing process? Least? AJ: My favorite part is writing the books without any interference from anyone else. There’s a very small piece of time in the process of writing a book when it only belongs to you and you can be selfish and private with it—that’s such a nice, peaceful period. I also really enjoy talking about my books with people who have read them, which is, like, the opposite of what I said a sentence before, but both are true. My least favorite part is everything else. I always think I’ll get a huge thrill from holding the printed book in my hand, and that is cool, but it’s often anticlimactic since by the time you get to that moment, you’re so over that book and on to the next one. JM: Other than the number of people who buy your books, what do you wish you could have more control over when your novels are released? AJ: Marketing and publicity and the elusive “buzz” element. There’s no substitute for word of mouth in this business, and if I could control how many people are talking about my book (I don’t even care too much about what they’re saying, really), I could effectively control how many people buy it. JM: Tell me a bit about your latest book, Tandem. Why did you like writing it? AJ: Tandem is about a girl named Sasha who lives in Hyde Park and goes to the Lab Schools (most of my books have a little bit of autobiography in them, and this one draws on my experience living in Hyde Park while going to U of C). She’s just a normal girl who gets dragged into a parallel universe to pose as her double, who is a princess in that world and has gone missing. I loved writing Tandem because I’ve always wanted to write an epic story with a big romance, and that’s exactly what it is. Building the world of the trilogy was definitely the most exciting part. I got to flex my creative muscles by imagining three very different universes and then slamming them all together and seeing how they interact, how they’re similar, and how they’re irreconcilably different. I’m also very interested in the ways in which we are connected to people and the places we’re from, and Tandem and its sequels really allowed me to explore that concept from many different angles. Plus, kissing. I like kissing scenes a lot, and writing them is really fun! JM: Tandem features parallel universes and inter-universe travel, and your second novel, The Opposite of Hallelujah, is also rooted in science. What draws you to this subject matter? AJ: I think I’m drawn to science because I want to be smarter than I am. I’m an educated person, and I read like crazy all the time, but I don’t consider myself someone who is very bright when it comes to math or science or anything that doesn’t have to do with words. But I want to be. It’s not all science, though—I couldn’t care less about biology. It’s physics for some reason, especially the theoretical—I sometimes wonder if my interest in theoretical physics has something to do with trying to reconcile the practical part of myself that knows that the world/universe has laws and rules with the part of myself that was raised religious and believes in a higher power. Even though The Opposite of Hallelujah is more explicitly about religion and science working together to help us understand the world—there are characters who are actually priests and nuns and the issues are tackled head on—I would say that Tandem and the other books in the Many-Worlds Trilogy are struggling with those issues just as much, if not more, as Hallelujah. That said, about 99.9% of the “science” in the Many-Worlds Trilogy was made up by me and only inspired by real scientific theories. It’s more mythology than science, to be honest. The quicker explanation is that my parents sent me to Space Camp as a kid and I never quite fell out of love with the sky. All things are probably true.